This is a photo from 1873 taken by Christopher Carli, who was a photographer who came before John Runk. He took photos of Stillwater and used many in stereo photo scenes. The gentleman in this photo is James Sinclair, another photographer in Stillwater. To View this same location as it appears today, click or tap on this link. Courtesy of Google maps 360 Street View. Photo credit, Mr. Owen Dunnigan. When Stillwater was founded in the mid-19th century, there was no easy way to reach what’s now known as the South Hill. “Nelson’s Field,” as it was called then (named for Socrates Nelson, an early settler and landowner), sat atop a bluff more than 100 feet high. But unlike the North Hill, there were no streets connecting it to the downtown below. And cutting through that bluff and filling in below to build such a connection would be a major engineering task. View north from the top of the South Main Street Stairs in 1872. This photo is from the John Runk Collection, courtesy of the Stillwater Public Library. This was a period of high activity for the lumber industry in Stillwater. This photo was taken in 1884. It is from the Runk Collection, courtesy of the Stillwater Public Library. You can see the Lincoln School above the horizon on the north hill. This also is a north view from the top of the south hill stairway. This view is from midway up the south hill, or taken from the building that stood at this location. The year is 1870. This is from the John Runk Collection, courtesy of the Stillwater Public Library. This is a later view than the previous photo, showing the construction of the brick building on the corner of Nelson and Main Streets. This photo may have been taken from the hillside or the building that stood at this location. 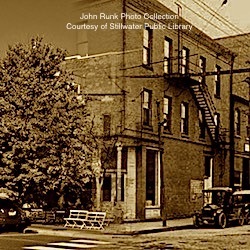 The photo is from the John Runk Collection, courtesy of the Stillwater Public Library.